As we continued towards Greenway, Richard was filmed talking to some of the other passengers so my commentary was sporadic because I didn’t want to cut in with the tannoy and spoil the filming. Ellie, who had been sitting behind me, asked if Richard could come and ask me some questions so I pulled into a bus layby while they got set up. I told them that it was noisy in the cab and that I might not hear what Richard was saying but they were keen to give it a try so I was fitted with a lapel mic and I continued through Goodrington and Churston Ferrers. This was the most difficult part of the filming, as I struggled to hear Richard’s voice. Not only that, but I had to concentrate on driving safely as well as talking to him! I think I made a fair attempt at answering his questions intelligently. Perhaps you can judge when the episode airs in the autumn! Once we had arrived at Greenway the passengers disappeared into the House but the film crew set up to record our ‘arrival’. With someone watching behind to make sure I didn’t run into any unsuspecting visitors, I reversed back along the driveway and awaited the signal to proceed. Starting gently in 3rd gear as if arriving normally, I pulled up beside the camera position. Richard alighted with a wave and a ‘thank you’ to me before he walked away. Of course the passengers were delighted to have been involved and, later that afternoon, we chatted about the conversations they’d had with our celebrity visitor. I found him a very charming chap to deal with and the crew were easy to work with too. Fortunately the bus and I were able to deliver everything they needed and they seemed pleased with the results. 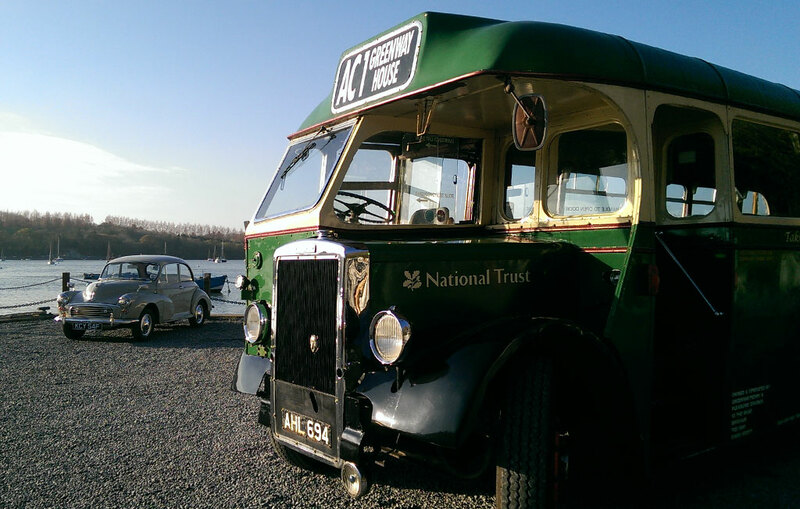 The rest of the day passed uneventfully and, as the late afternoon bathed the quay, I decided to take a photo of the bus with my little Morris Minor in the background. 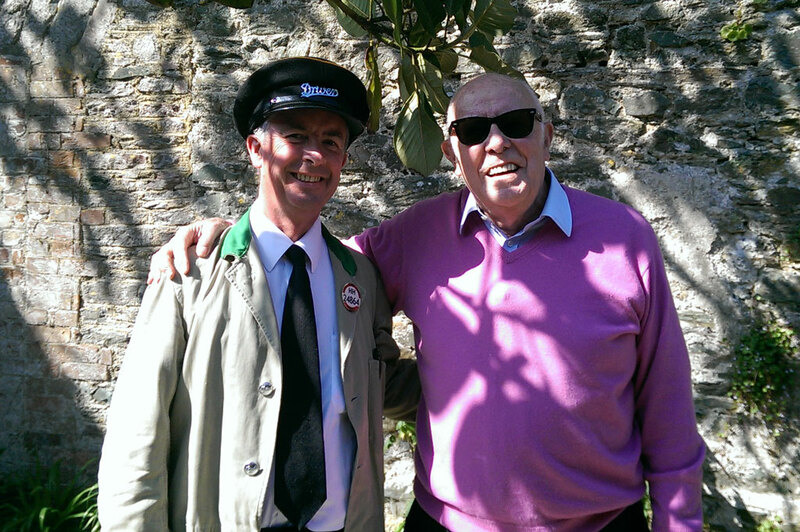 I will try to pass on the broadcast date of Richard Wilson’s visit to Greenway House when the info is published. This entry was posted in Driving, Local bus service and tagged Agatha Christie, Greenway House, Richard Wilson, Victor Meldrew. ← Save wear and tear on your clutch: don’t use it! Sounds like you had a great day and a great experience John. First your picture in Bus and Coach Preservation and then ‘being on the Telly’ fame indeed. Hope you do not get left on the cutting room floor. I am sure you will keep us posted. Can I have your Autograph? All the best people have/had Morris Minors!